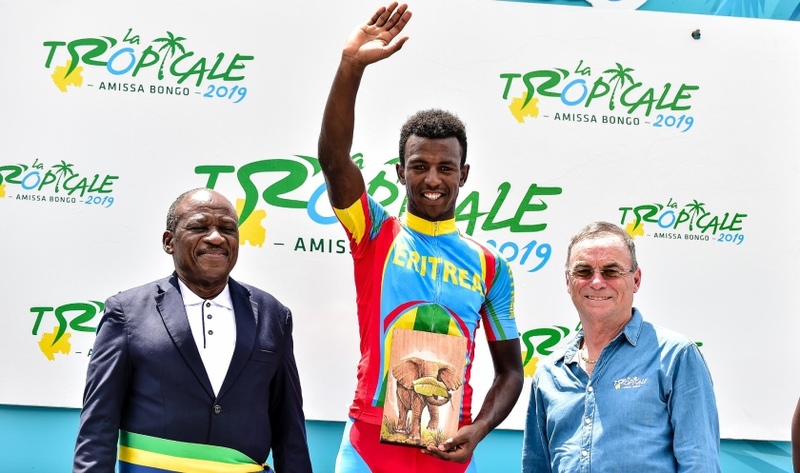 Eritrea’s Biniam Girmay Hailu surprised everyone by winning the 3rd stage of the Tropicale Amissa Bongo in the sprint beating professional riders such as the eleven-time Tour de France winner Andre Greipel of France. Eritrea’s Biniam Girmay surprised everyone by winning the 3rd stage of the Tropicale Amissa Bongo in the sprint, which arrived to Franceville from Léconi after 100km of racing. The 18-year-old, who had distinguished himself last year in the juniors by beating Remco Evenepoel on the first stage of Aubel-Thimister-Stavelot, thus signs his first victory among professionals. He was ahead of the Algerian Youcef Reguigui and Italy’s Niccolo Bonifazio (Direct Energie), who had won the first two stages and who remains at the top of the overall standings. André Greipel (Arkéa-Samsic) took 5th place, overall 3rd, just 14 seconds behind Bonifazio and one second behind runner-up Sirak Tesfom (national team Eritrea). After the start in Léconi near the border with the Congo, a breakaway duo quickly broke away – with Henok Mulueberhan (national team Eritrea) and defending champion Joseph Areruya, who drives here for the national team of Rwanda, but otherwise the French ProContinental team Delko – Marseille Provence is under contract. The duo pulled out 2:40 minutes ahead, but was then overtaken again after 35 kilometers. Now, a new, five-person leading group established itself around Metkel Eyob (national team Eritrea). The quintet was not left out of the main field for more than 1:40 minutes. Direct Energie controlled the pace in the peloton with the confidence of Bonifazio’s two opening victories in the back, eventually creating the perfect timed combination around five kilometers from the finish. It came to the third mass sprint in a row, this time with a surprising winner from Eritrea, instead of one of the European aces Bonifazio, Greipel or Lorrenzo Manzin (Vital Concept – B & B Hotels). Biniyam Ghirmay is not unknown for some people. The Tropicale Amissa Bongo in Gabon runs for seven days, with all stages being largely flat – although mostly carried out on a plateau some 600 meters above sea level. The topographically difficult stage finale already held the first stage in Moanda – with a 2.7-kilometer final climb at 5.5 gradient percentages. Even there, however, it came to mass sprint.